A person driving a car needs fuel, but if they carry with them nothing except fuel and if they imagine that fuel can satisfy their hunger and thirst, then they are mistaken – horrendously, tragically, ludicrously mistaken. Similar is the plight of those who make money their life’s defining purpose. Money is often the stuff of our strongest fantasies. Such longing is understandable given that money is essential for getting our necessities. Yet this longing for money can easily degenerate into an unbalanced, uni-dimensional obsession. This obsession has little to do with our needs, and everything to do with our wants, wants triggered largely by today’s corporate controlled media. To let money acquire exclusive control over our aspirations and actions is to set ourselves up for disaster. Money slowly but sinisterly treads over and then tramples on all other aspects of our life, aspects that bring meaning and fulfillment to our life, aspects that make our life worth living. 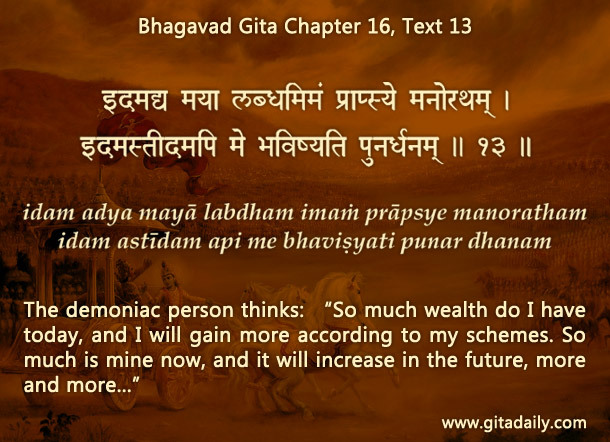 The Bhagavad-gita (16.13-15) outlines the money-centered megalomaniac mentality that can transmogrify people into murderers of their rivals. Those who drink car fuel hurt themselves. Similarly, those who live only for money end up hurting themselves. Only when we recognize that we are meant to be more than money-minting machines can we ensure that money aids our purpose and doesn’t become our purpose. To keep money in its proper place in our priorities, we can draw from the Gita’s explanation of our being and the purpose of our being. We are souls meant to find lasting fulfillment through pure spiritual love – love for Krishna and all living beings in relationship with him. This aspiration helps us redefine money as a resource meant for service and contribution, not for aggrandizement and exploitation. Thus, we can devotionally use our money and our life for finding deep inner fulfillment. Awesome selection of words prabhuji in rendering a great message…. Choice Poetry. Thank you for your appreciation. Grateful to be of service.